For months I'd been having issues with lag and stuttering in the PC version of Battlefield 3. Worse, though, were frequent, seemingly random disconnects. I'd connect to a server, be able to play for 10 minutes or more, then my system would lock up hard, unresponsive even to Ctrl-Alt-Del for a few minutes until finally BF3 exited and the Battlelog site came back with anything from a disconnect message to one saying I'd been kicked from the server. Despite having the latest updates to BF3 itself, as well as for EA's bloated and unnecessary Origin software, PunkBuster, and my system's video drivers and Windows updates, the disconnects continued to occur, making it so that I seldom if ever got to the end of a round without being disconnected. Finally I decided to take the plunge and configure my DSL router with port forwarding specific to BF3's needs, according to this page on EA's support site. 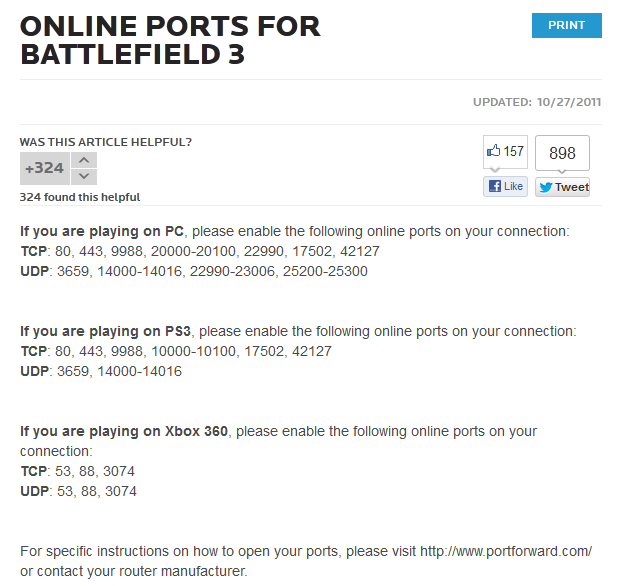 The site PortForward.com handily provides instructions specific to many router makes and models for the PC, XBox 360, and PS3 versions of Battlefield 3. One note, for the listed TCP ports specific to the PC version, I found that all but ports 80 (http) and 443 (https) were necessary to seemingly work around the disconnect issues I'd been having. You might need these ports forwarded if you plan to have your PC act as a BF3 server, but given that I don't it doesn't seem to make a difference. Why the BF3 installer or the game itself doesn't specifically tell you which ports to forward in the beginning I don't know. Why EA and DICE rush out their games hurriedly without addressing their users' complaints, I don't know either. I'm happy to have found this works around my problem, and that the game is at least playable for more than 10 minutes or so at a time, but given their track record with previous games and their various issues, I'd like to see BF3 go open source someday and get in the hands of numerous software developers who would likely care more about the game and its users than EA.